This year, San Francisco’s iconic Golden Gate Bridge celebrates its 75th anniversary. There are celebrations for this landmark year (pun totally intended) in San Francisco this weekend, and we have such a great sense of city pride knowing that such a cool event is happening this year, and right now … but we are unfortunately NOT in San Francisco at the moment! We are actually in Portland this weekend, helping our friend Laurie. As sad as I am not to be able to take part in the festivities back home, I am even more happy to help my friend, and to be able to visit our other dear friends who live up here as well! 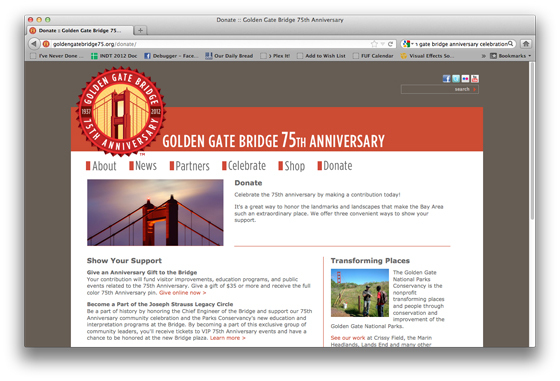 So to celebrate the Bridge’s 75th anniversary, I thought since I can’t be there, the next best thing would be to become a member of Golden Gate Parks Conservancy, so that I can support the bridge and parks year-round. The goal of our work is to preserve the Golden Gate National Parks, enhance the experiences of park visitors, and to build a community dedicated to conserving the parks for the future. Alongside the National Park Service and the Presidio Trust, the Parks Conservancy fulfills its mission of “Parks For All Forever”. -Offer environmental education and youth leadership programs at the Crissy Field Center. -Build and maintain trails through the “Trails Forever” Initiative. -Improve park signage, kiosks, visitor centers, and other facilities. -Support the interpretive and visitor service programs at the Golden Gate Bridge. -Grow native plants to restore landscapes in our native plant nurseries. -Protect and restore habitat for endangered species through Park Stewardship. -Study birds of prey at the Golden Gate National Raptor Observatory. -Encourage underserved communities to experience the parks. -Organize volunteers of all ages to support our park projects. -Provide tours, bookstores, interpretive merchandise, and cafes to serve visitors. It took all of five minutes for me to put in my information this morning and become a member. For just the lowest denomination of $35, you get member benefits like discounts at park stores and free admission to Park Academy classes, and because of the special 75th Anniversary of the Golden Gate, I’ll get a commemorative pin as a thank you gift. Awesome! This small act helps me feel like I’m celebrating with everyone else, it’s great to know I’m supporting the wonderful parks and that gorgeous bridge we all love, and I’m happy to be helping to keep the Best City in the World beautiful for everyone to enjoy.